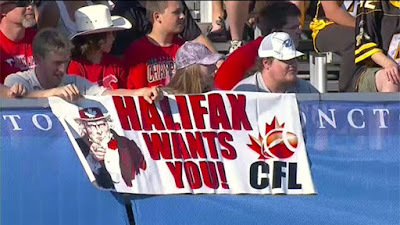 HALIFAX - The contest to name Halifax's proposed CFL team appears to be a "horse race'' between Atlantic Schooners and Atlantic Storm, according to a businessman trying to land a franchise for Atlantic Canada's largest city. In an interview, Anthony LeBlanc of Maritime Football Partnership wouldn't say what name has the upper hand, although many believe Schooners is the odds-on favourite to be announced Friday at an event during Grey Cup festivities in Edmonton. "I'm surprised that it is as close as it is,'' LeBlanc said of the contest. People who have laid down season ticket deposits have also had the opportunity to submit their own team names, and at least two - Privateers and Destroyers - proved intriguing, said LeBlanc. He said Privateers was a particular favourite, although it ultimately can't be used. "Unfortunately it (Privateers) has already been secured by the lacrosse team that is coming to town,'' he said. LeBlanc said details outlining a broader campaign would also be announced during Friday's event. He has previously said it is important to get a "nice base'' of season ticket holders to help fill a proposed 24,000-seat stadium, and he feels 12,000 is an achievable goal. The partnership's efforts to land a team cleared a major hurdle last month after Halifax Regional Council directed city staff to do a business case analysis of the group's stadium proposal. The partners have proposed vacant land in Shannon Park on the east side of Halifax harbour as the stadium site, and say the $170-million to $190-million project would need public money. Under the proposal, the owners of the Shannon Park development would pay property taxes on the real estate, but that money would be set aside by the municipality and returned as a payment against the stadium's debt. LeBlanc said it's hoped the results of the regional municipality's analysis would be available by early spring. Friday's team-name announcement in Edmonton with CFL commissioner Randy Ambrosie is scheduled be simulcast at the HFX Sports bar in Halifax at 9 p.m. local time. They could use Calgary's uniforms and call themselves the BLACKREDS. Still undefeated?? ?....well enjoy it ...cause when ur team does come into the league, their gunna be the whipping horse of the league....Go Riders! !